It has happened to all of us be it a runaway shopping cart, being careless while opening your door, tight garage spaces, hail storm or any of those oops moments! Over time all vehicles get dings and dents but not every moment calls for a body shop. Ask us first! 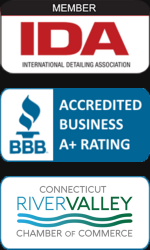 M&M Auto Detailing offers CT Dent Repair services such as removing dents, dings, creases and hail damage from your vehicle without affecting the original factory finish. Our skilled technicians use specially-designed tools to reform body metal back to its original condition and all M&M Auto Detailing vehicle dent repairs are covered by a 100% Lifetime Warranty (details of warranty available upon request). Our paintless dent removal process is faster than traditional dent removal methods and can be accomplished for 1/2 the cost.